You are here: Home / Departments / Lawn & Garden / Yeti Coolers, Ramblers, Tumblers and Accessories In Stock Now! Yeti Coolers, Ramblers, Tumblers and Accessories In Stock Now! At Capps Home Building Center, we’re passionate about providing our customers with only the best in home building supplies. Recently, we have branched out to embrace the best outdoor brand available—YETI. People love the products from YETI because they are high quality and extremely functional. Tough, durable and effective, everything from the YETI cooler to YETI drinkware is designed with a purpose that it lives up to. Whether you’re taking it to the job site or on a camping trip, it definitely is a choice that will leave you with a smile on your face. We’ve chosen to partner with the brand because we know our customers appreciate the quality and diversity of their products. 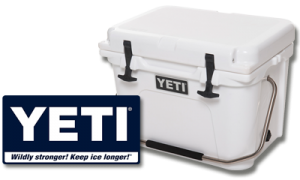 Our most popular YETI products include the YETI rambler, coolers, tumblers, colsters and bottles with a wide array of additional gear, like YETI shirts and hats, straight from their warehouse. Our goal is to make it easier for our clients to get all of their construction supplies in one place, and by adding items like the YETI cooler and drinkware, we hope to make our store even more convenient. Every shopper wants to know they can trust the company they shop at. For the past 38+ years, we’ve supplied the Smith Mountain Lake area including Roanoke and Lynchburg with reliable and high quality products and services. Our inclusion of the YETI brand was a natural progression for us. If you’re looking for their products, we are more than happy to help. We not only simplify the purchasing process, but we do it all with family friendly customer service. We warmly invite you to stop by the store and check out our new inventory of YETI brand products. Choose us if you’re looking for a brand new YETI cooler, rambler, drinkware or virtually any of their products. Our selection is sure to fit your needs.